The legacy of the Doctor Who Christmas Special will continue this year, and we just got our first look at the upcoming annual Christmas episode. BBC has just released a new behind the scenes video, showcasing the production of the Doctor Who Christmas Special this year, but more importantly, some sweet footage from the episode. The first footage debuted during a panel at New York Comic Con, which is taking place now through Sunday. Luckily, BBC was kind enough to upload the footage to the Doctor Who channel on YouTube for everyone to see. This year, Doctor Who will be dipping its toe into the superhero world. The episode, titled "The Return of Doctor Mysterio," will feature the Doctor helping a caped crime fighter to save New York. Doctor Who showrunner Steven Moffat, who is departing the show after season 10, had this to say during the panel. "I've always loved superheroes and this Christmas Doctor Who dives into that world. My favourite superhero is Clark Kent. Not Superman, Clark Kent." 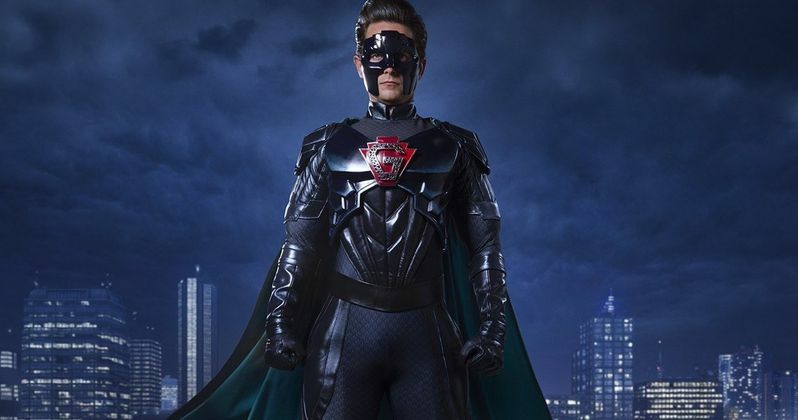 Justin Chatwin, of Orphan Black fame, will be playing the role of the masked hero in this new Doctor Who Christmas Special. This morning, the BBC America Twitter account posted a picture of Justin Chatwin in his superhero getup, which we will be seeing in its full glory this December. The costume looks very 90s Batman-esque, which should fit in very nicely in the Doctor Who universe. The tradition of the Doctor Who Christmas Special dates back to 1965 from an episode that is actually missing from the BBC archive. In that episode, the first Doctor William Hartnell breaks the fourth wall and says to viewers "Incidentally, a happy Christmas to all of you at home." Once Doctor Who was revived in 2005, the annual Christmas Special became a staple for fans to look forward to every year. "The Return of Doctor Mysterio" will air on BBC One this December. The special 60-minute episode was written by Steven Moffat, who is leaving Doctor Who as the showrunner, with Broadchurch executive producer Chris Chibnall taking over as showrunner for season 11. Charity Wakefield, Matt Lucas, Adetomiwa Edun, Aleksandar Jovanovic and Logan Hoffman will star alongside Justin Chatwin and Peter Capaldi in this years Doctor Who Christmas Special. Be sure to check out the first look at the episode for yourself below.